Macalester sophomore Julia Gay leads a rally during Contingent Faculty Appreciation Week on campus. Despite public appeals from students, instructors and U.S. Rep. Keith Ellison to take a neutral stance, Macalester College administrators last week announced their opposition to efforts by contingent faculty members to organize a union. Macalester President Brian Rosenberg and Provost Kathy Murray revealed their opposition in a memo sent May 2 to the school’s tenured and tenure-track faculty members, who are not a part of the organizing drive. Macalester’s student newspaper, The Mac Weekly, obtained a copy of the memo. Rosenberg and Murray also declared their intent to tell contingent faculty members “why the College is opposed to this effort” before they vote on whether to join Local 284 of the Service Employees International Union. The vote is likely to take place in June. 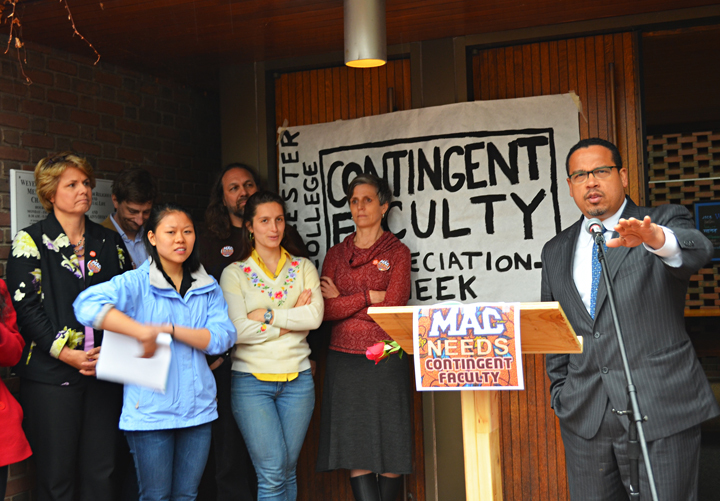 U.S. Rep. Keith Ellison urges Macalester to remain neutral during contingent faculty’s organizing drive. In forgoing neutrality, the administrators turned a blind eye to a sizable demonstration on campus last month. 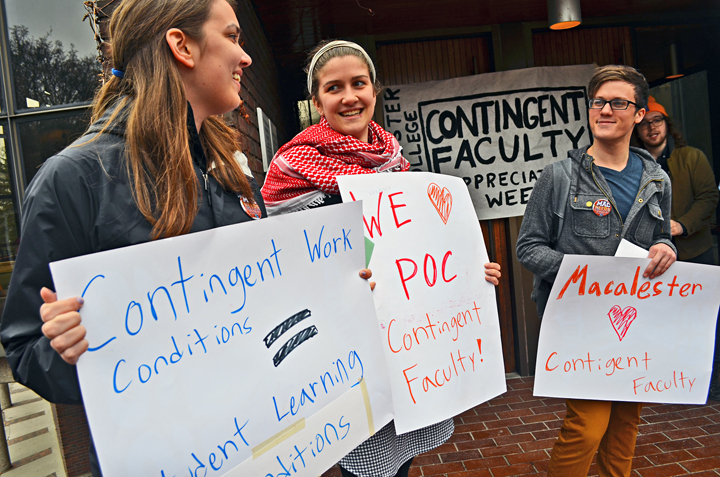 The culmination of a student-organized “Contingent Faculty Appreciation Week,” the rally drew students, faculty members and community leaders who showed their support for the organizing drive – and voiced their opposition to interference from the administration. Contingent faculty members at the rally said they approached forming a union as a proven method of achieving greater job security, more professional development opportunities, higher pay and more reliable benefits. And like any group of workers looking to organize, they want a voice in decisions that affect their working conditions. Better working conditions for contingent faculty, visiting assistant professor Brendan Miller added, will increase stability inside the classroom – and increase instructors’ availability to students outside the classroom. Faculty members are paid substantially less per course if they do not teach a full course load, forcing many to pick up courses at campuses across the metro. That makes it especially difficult to work with students outside of class hours, Miller said. Eric Otremba, a visiting professor of history at Macalester, thanks students for organizing Contingent Faculty Awareness Week. 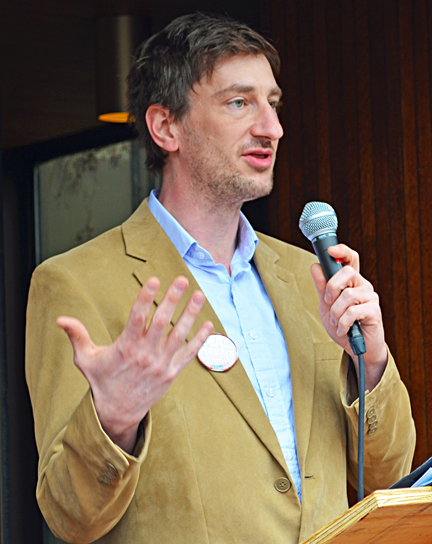 Miller, who teaches physics and astronomy at Macalester, pointed to a list on the school’s website of key reasons students should choose to enroll, including a strong commitment to teaching, low student-to-faculty ratios and opportunities for interaction between faculty and students. Still, contingent faculty members are treated differently than their tenured and tenure-track colleagues – a fact that initially surprised sophomore Kathy Paral, one of the organizers behind Contingent Faculty Appreciation Week.